And if I might for a moment trumpet! How much better is this amiable miniature than the Real Thing! Here is a homeopathic remedy for the imaginative strategist. Here is the premeditation, the thrill, the strain of accumulating victory or disaster—and no smashed nor sanguinary bodies, no shattered fine buildings nor devastated country sides, no petty cruelties, none of that awful universal boredom and embitterment, that tiresome delay or stoppage or embarrassment of every gracious, bold, sweet, and charming thing, that we who are old enough to remember a real modern war know to be the reality of belligerence. This world is for ample living; we want security and freedom; all of us in every country, except a few dull-witted, energetic bores, want to see the manhood of the world at something better than apeing the little lead toys our children buy in boxes. We want fine things made for mankind—splendid cities, open ways, more knowledge and power, and more and more and more—and so I offer my game, for a particular as well as a general end; and let us put this prancing monarch and that silly scare-monger, and these excitable "patriots," and those adventurers, and all the practitioners of Welt Politik, into one vast Temple of War, with cork carpets everywhere, and plenty of little trees and little houses to knock down, and cities and fortresses, and unlimited soldiers—tons, cellars-full—and let them lead their own lives there away from us. My game is just as good as their game, and saner by reason of its size. Here is War, done down to rational proportions, and yet out of the way of mankind, even as our fathers turned human sacrifices into the eating of little images and symbolic mouthfuls. For my own part, I am prepared. I have nearly five hundred men, more than a score of guns, and I twirl my moustache and hurl defiance eastward from my home in Essex across the narrow seas. Not only eastward. I would conclude this little discourse with one other disconcerting and exasperating sentence for the admirers and practitioners of Big War. I have never yet met in little battle any military gentleman, any captain, major, colonel, general, or eminent commander, who did not presently get into difficulties and confusions among even the elementary rules of the Battle. You have only to play at Little Wars three or four times to realise just what a blundering thing Great War must be. Great War is at present, I am convinced, not only the most expensive game in the universe, but it is a game out of all proportion. Not only are the masses of men and material and suffering and inconvenience too monstrously big for reason, but—the available heads we have for it, are too small. That, I think, is the most pacific realisation conceivable, and Little War brings you to it as nothing else but Great War can do. - H.G. 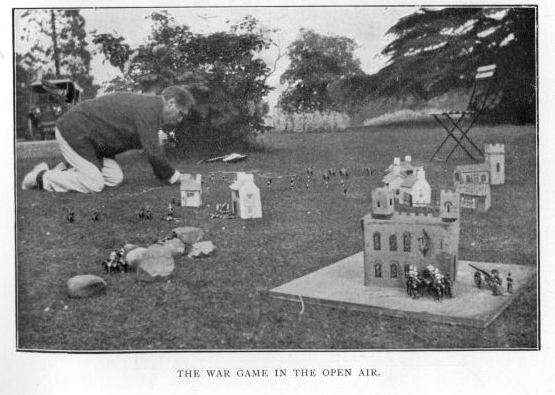 Wells, from the rulebook for "Little Wars," a game he designed.